Making your own vanilla extract is simple! All you need are vanilla beans, vodka, and a glass jar. Vodka has the most neutral flavor, but you can also use bourbon, rum, or brandy to create unique extracts. 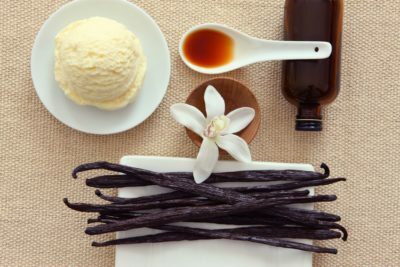 You can use any type of vanilla bean, keeping in mind that vanilla beans are produced in several countries and come in different varieties and grades. Bourbon vanilla has the classic, robust flavor, Tahitian vanilla is subtly fruity and floral, while Mexican vanilla tends to be smooth and spicy. Create a single origin vanilla extract or invent your own blend — it’s up to you! Why make your own vanilla extract? Well, first thing, it is easy to make. Also, you’ll never run out of vanilla again and making homemade vanilla extract might even be economical, given that you’ll never run out of it. Another frugal perk of making your own homemade vanilla extract is that you can re-use the beans and make more!When you run out of extract, fill the container back up with more alcohol, set it aside and soon you’ll have another batch of homemade vanilla extract. 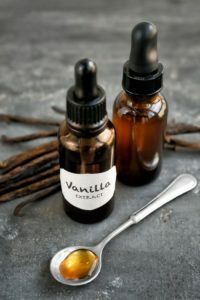 Also, keep in mind that, despite the fact that we typically use vanilla extract only a teaspoon at a time, health-wise, it’s concerning that are unnecessary and potentially harmful additives and sweeteners that are legally allowed to be in in the ingredients in store-bought vanilla extract. Especially when you assumed that “vanilla extract” only contained vanilla. So, with all that being said, set aside 10 minutes of your time and whip up some Homemade Vanilla Extract using this recipe. Split the vanilla beans: Split each vanilla bean in half lengthwise. If you like, you can leave an inch connected at the end of the bean for an attractive presentation. You can also chop the beans into smaller pieces if necessary to fit in your jar or bottle. Infuse for at 8 to 10 weeks: Store the jar or bottle of vanilla beans in a cool and dark place. Let the vanilla extract infuse longer if you are looking for a stronger flavor. Watch our video to learn more about How to Make Your Own Vanilla Extract.